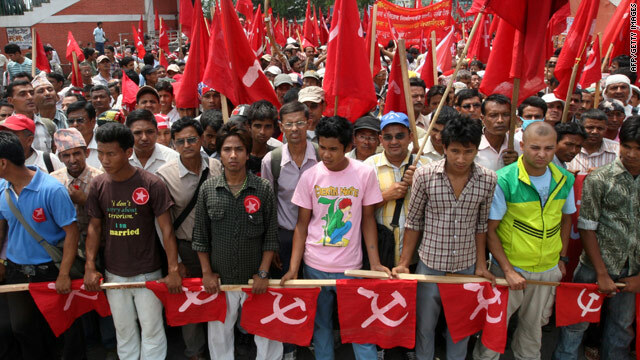 Nepalese workers affiliated to the Unified Communist Party of Nepal rally in Kathmandu on May 1. Kathmandu, Nepal (CNN) -- Thousands of Maoist supporters swarmed into Nepal's capital Saturday for a May Day rally that was also intended to press the government to step down. Police estimated 100,000 people had shown up for the rally. The Maoists said they expect to have about 500,000 supporters. Protesters are demanding that the prime minister step down and that the Maoists be able to lead the government again. The protests come during a difficult political phase in Nepal, with the deadline to draft the constitution coming at the end of the month. The Maoists have threatened an indefinite general strike starting Sunday if Prime Minister Madhav Kumar Nepal does not resign by Saturday evening. "The other parties want us to take back the strike but we will not do that unless the government resigns," Krishna Bahadur Mahara, a leader of the Communist Party of Nepal (Maoist). told CNN. There have been intense negotiations between the Maoists and the governing coalition over the past few days with no resolution. The Maoists were the largest party in the previous coalition government, but their leader, Pushpa Kamal Dahal -- commonly known as Prachanda -- resigned as prime minister a year ago because the president overturned his decision to fire the chief of army staff. The Maoists declined to join the next coalition government under the current prime minister, upset that the government was not making moves to integrate about 19,000 former rebels into the army. Protesters Saturday were sheltering in offices, schools and construction sites. Maiya, who goes by one name, told CNN she traveled 10 hours by bus from eastern Nepal to Kathmandu but did not know why she was there. "They said there was a program and told us to come," she said. But Bal Bahadur Pahar, who came from another district, said, "I am here to capture state power." The U.S. Embassy in Kathmandu called on all parties to exercise restraint during the demonstrations and find a way to resolve the current political impasse. U.S. Ambassador Scott DeLisi said he had spoken with Dahal and urged that he and the Maoist leadership do everything possible to keep the rallies peaceful. He said he had also spoken with the government to urge restraint. "Nepal has come a long way since the Comprehensive Peace Agreement was signed in 2006 and these gains should not be lost," DeLisi said in a statement. That agreement ended the Maoists' decade-long insurgency, with the Maoists signing a unilateral cease-fire and the government announcing the start of peace talks. Both sides have since signed a number of agreements, including one for an arms management process, according to the U.S. State Department. An interim government with Maoist members followed, and in April 2008 Nepal held elections for a new Constituent Assembly, which serves as the parliament. The Maoists won 38 percent of the seats in the new assembly, and Dahal was sworn in as prime minister. After Dahal resigned in May 2009, members from 22 of the 24 political parties in the assembly elected Nepal to replace him. That 22-member coalition does not include the Maoists. Coalition members met earlier Saturday and advised Nepal not to resign. The prime minister was scheduled to address the nation in the evening. Asked at a news conference how long Sunday's general strike will last, Maoist leader Baburam Bhattarai said the Maoists have the resources to fight the government until it resigns. CNN's Sara Sidner and Journalist Manesh Shrestha contributed to this report.